Ripon-based Econ Engineering, which manufactures the majority of the winter maintenance vehicles used by local authorities and contractors on the UK’s roads, has appointed Steve Sinnott to a key role within its sales team with responsibility for clients in the South of England, as well as key highway maintenance and waste management accounts. Steve joins Econ with over 25 years experience in sales and building customer relationships, in the fleet and specialised vehicles sector, including five years as one of the top sales managers at Mercedes-Benz?s commercial vehicle dealership, Intercounty Truck & Van. In appointing Steve we are confident that his outstanding customer relations track record in both the public and private sectors will be a real asset to the team. Econ is unique in developing vehicles that are designed and manufactured in this country, specifically for the UK road network and to meet the challenges of the British weather. This year will see further developments and improvements with significant new Econ product launches. The service division will be further boosted, guaranteeing that our team of dedicated, highly trained engineers is on hand at all times to ensure that our clients can expect maximum up-time from their Econ vehicles. 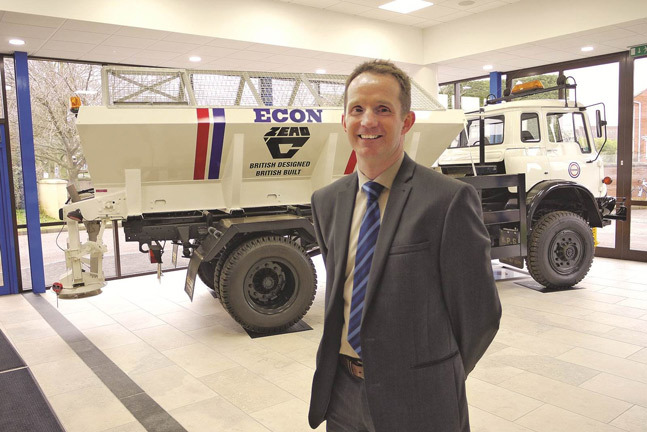 Steve is the latest recruit to join the £25m turnover, family-owned Econ Engineering, which was established in 1969 and has grown to become the UK’s leading producer of winter maintenance and road mending vehicles. The Ripon factory now employs over 190 staff and manufactures 12 new specialist road maintenance vehicles a week. It is tremendously exciting to be joining Econ at a time when their reputation for all round excellence is stronger than ever. The company’s market share is phenomenal and I am looking forward to continuing the Econ tradition of offering sound advice to customers, as well as bringing some fresh ideas where I can.